The focus on the Mueller investigation seems to be Paul Manafort. Manafort is currently being held in solitary confinement in a Virginia jail because of alleged witness tampering. Does anyone doubt that this is an attempt to get him to make something up that Mueller can use against President Trump? Meanwhile, The Washington Examiner reported yesterday that Mueller has now revealed the relationship between the Trump campaign and Manafort. In May, the Wall Street Journal reported that Mueller is investigating whether the loans were “made as part of a quid pro quo arrangement to secure Mr. Calk a job in Mr. Trump’s administration.” Calk has denied any such arrangement. If Mueller investigated every horse trade that took place in Washington, I am sure he would find an awful lot to keep him busy and nothing noteworthy! Last week I posted an article about a donation given to the Southern Poverty Law Center (SPLC) by George and Amal Clooney. The donation was made in response to the events in Charlottesville, Virginia, and was given ‘to combat hate groups. As I explained in the article, according to the SPLC, a hate group is any group of people who do not share the same beliefs as the SPLC. That is the danger of designating hate groups–there may be a few we all agree on, but there is also a lot of room for disagreement. PJ Media posted an article yesterday reporting that the SPLC is being sued by some of the groups it has designated as hate groups. Now, some of the groups slandered by this organization have begun to fight back — and it’s not just Christian groups like D. James Kennedy Ministries and Liberty Counsel. “The SPLC, who made their money suing the KKK, were set up to defend people like me, but now they’ve become the monster that they claimed they wanted to defeat,” Maajid Nawaz, a British politician and founder of the anti-Islamist organization the Quilliam foundation, declared in a video announcing his lawsuit against the SPLC for defamation. In June, the charity navigation website GuideStar adopted the SPLC “hate group” list, marking each profile of the targeted organizations as a “hate group.” ABC and NBC parroted the SPLC’s “hate group” label against Alliance Defending Freedom (ADF) last month, and CNN published the group’s “hate map” online. But the SPLC does not deserve this widespread trust, support, and publicity. The organization is a “cash-collecting machine” that spreads libels against religious organizations and has been connected to two domestic terror attacks. There have been two domestic terror attacks that have connections to the SPLC. The first was the shooting of Representative Steve Scalise (R-La.) early this summer (James Hodgkinson had liked the SPLC on Facebook. The SPLC had attacked Representative Scalise for giving a speech to a white supremacist group.) The second attack occurred in 2012 when Floyd Lee Corkins III broke into the Family Research Council (FRC), aiming to kill everyone in the building. The article reports that during an FBI interrogation, the shooter said he targeted FRC because it was listed as an “anti-gay group” on the SPLC website. The article at PJ Media centers on the lawsuit by Maajid Nawaz, a British politician and founder of the anti-Islamist organization the Quilliam foundation. Whatever their intention was at their inception, the SPLC has become a political hate group that has discovered a way to make money through lawsuits and gifts from people who want to feel good about ‘combating hate.’ It is my hope that a few lawsuits will convince them to find other ways of making a living. Please follow the link above to the PJ Media article. It is chilling that an organization that claims to be fighting hate can be so misused by the political left. At the moment, the SPLC is being used as a weapon to stifle Christian beliefs and conservative speech. That is not a direction America should be moving in. In What Universe Is This Logical? The New York Daily News is reporting today that ESPN is changing its announcer for the Virginia–William & Mary football game this season. 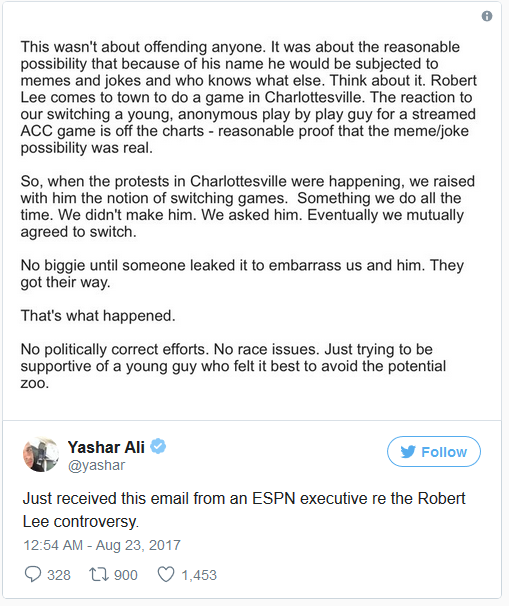 The announcer originally scheduled to cover the game was an Asian man named Robert Lee. Are we so immature that allowing this man to announce a football game is a problem? Obviously he is not related to Robert E. Lee, nor should it matter if he were. Robert E. Lee lived more than a hundred years ago. He’s been dead a long time. How is he relevant to a football game? I would have believed this story if it had been posted by The Onion, but it is hard to believe that it is true. What has happened to the maturity level of the average American? David Horowitz is what is called a ‘red-diaper’ baby. His parents were admitted communists who taught in the New York City schools. He was one of the founders of the New Left in the 1960s and an editor of its largest magazine, Ramparts. In the 1990’s, after an incident during which he learned the true character of the Black Panthers, David Horowitz began moving toward more conservative thought. His story is told in his book Radical Son. Because of his involvement in leftist political causes as a young man, he understands how the political left works. Today he posted an article about the events in Charlottesville at Newsmax. The organizers of the “Unite the Right” demonstration in Charlottesville were repellent racists. Not unlike the Nazis who marched in Skokie, Illinois, years ago, they had the right to march. No one had to agree with them, but had they been left alone, they probably would not have even made the news. What “Unite the Right” actually demonstrated was that the assortment of neo-Nazis, pro-Confederates, and assorted yahoos gathered under the banner of the “Alt-Right” is actually a negligible group. Compare that to the tens of the thousands who can readily be marshaled by two violent groups of the left — Black Lives Matter and Antifa — and you get an idea of how marginal “white supremacists” are to America‘s political and cultural life. Omitted from the media coverage were the other forces at work in precipitating the battle of Emancipation Park, specifically Black Lives Matter and Antifa, two violent left-wing groups with racial agendas who came to squelch the demonstration in defense of the monument. Two parties, two culpabilities; but except for the initial statement of President Donald Trump, condemning both sides, only one party has been held accountable, and that happens to be the one that was in the park legally. The media is playing a major role in tearing America apart. I can’t help but wonder if they will like the results if they are successful in separating us into warring groups and stealing our history and identity as Americans. I need to say up front that I have no direct information on this incident. I am, however, very suspicious about the way it is being reported. There was a rally today in Charlottesville, Virginia, that turned ugly. The rally was sponsored by a group called #UniteTheRight. Basically the purpose of the rally was to protest the tearing down of statues that are part of American history that some people have decided are offensive. The people the statues represent may or may not be offensive, but these people are part of American history. Like most of the rest of us, they tried to do what they considered right within the circumstances of the time in which they lived. A little tolerance is in order. It is totally unfair to judge those who lived more than a hundred years ago by the standards of today. How do you think future generations will judge the black genocide in America that is the result of government policies regarding abortion? The media is reporting the rally as a white nationalist rally. First of all, since when is nationalism white? Nationalism under normal circumstances is a good thing. Americans need to be proud of their country and its culture. We were pioneers in personal freedom and responsibility. We made mistakes, but there were many things we did right. Women vote, minorities vote, and in spite of what you have heard, when honestly calculated, women are paid as much as men. We still have equal opportunity in America, and we still have the freedom to voice opinions that may differ from the majority. We need to ask why this rally turned violent. We also need to look at the way the rally is being characterized in the media. I am not sure that we will get any honest answers as to what actually happened from the media in the coming days, but as I said in the beginning of this article–I remain skeptical. I don’t see any difference between the Ku Klux Klan, the neo-Nazis and the antifa. I don’t agree with any of them, but all of them have the right to protest–none of them have the right to be violent. It would be interesting to know where the protesters on both sides were from. How did they get there? Were they paid? Were any expenses paid for them? Who planned this rally? Who planned the protest? What were the instructions given to those attending? What is the news story that is not on the front page because this rally is taking center stage? It is time to be skeptical and assume that we are simply not being told the entire story and that the story we are being told may not be the truth. Yesterday Lifezette posted an article about voters in Virginia. The Virginia Voters Alliance has released a report based on findings from the Public Interest Legal Foundation. The report shows that more than 1,000 aliens, or residents who are not U.S. citizens, have been free to vote illegally in Virginia. …The Virginia Voters Alliance looked into the issue first with Alexandria, Virginia. The alliance noticed that the Northern Virginia city had more people registered to vote than eligible voters who lived there. It’s time we started prosecuting people who vote illegally. I suspect that would at least slow down the number of illegal votes fairly quickly. This is another example of why we need voter identification and proof of citizenship to register to vote. The media is going after Donald Trump with guns blazing. Why? Because he is a serious threat to the status quo. The first victim of this attack is truth. It has long since left the building. The latest example is pointed out in a PJ Media story posted yesterday. The story deals with the media reporting of a Trump rally in Loudoun County, Virginia, earlier in the week. The rally was held with only 24 hours notice, and approximately 2000 people were turned away because the crowd was so large. One attendee posted his observations on Facebook. Please read those observations and compare them to what you have heard on the media. After the welcome (by John Whitbeck), invocation (by yours truly), pledge (by Sheriff Michael Chapman), and National Anthem (by Briar Woods High School Teacher Nina Peyton), we waited back stage to get a photo with Donald Trump. And then – he was there, with a crowd of staff, Loudoun County Sheriff’s deputies, and Secret Service. I was immediately struck by his presence – he radiates confidence, but also I was struck by his soft spoken demeanor. He spoke softly and thoughtfully the entire time we were backstage. The first person to get a photo with him was an older man. We had been chatting before-hand while all of us were waiting for Trump to arrive, and he introduced himself as Lieutenant Colonel Louis Dorfman and he had served in the 82nd Airborne. He shook hands with Donald Trump, and handed him his Purple Heart saying he wanted Trump to have it as thanks for standing up for wounded vets. Trump was surprised and said something like “I can’t take this!” We were all surprised and not expecting this. It was pretty cool to see the respect this veteran had for Trump. Then it was my turn to shake hands with Trump and get my photo taken. I told Mr. Trump that I was the chairman of the Loudoun County Republican Committee and he immediately stopped and looked at me: “Will, how do I win Loudoun?” he asked me. We started talking and he called over one of his staffers. “George, these people here in Virginia know what we need to do to win Virginia.” And then – in a really cool turn of events – John Whitbeck, the GOP chairs of Prince William County and Arlington County, Trump’s campaign staffer, and me are all huddled in a corner, photos forgotten, strategizing on how Trump will win Virginia. Trump didn’t do a lot of talking. He listened to all of us, he made sure his staff had our emails, and he said that we would have everything we needed. As we finished up the photos, Trump looked at all the Sheriff’s Deputies. “Let’s get them in the photo,” he said. And then he was taking group photos with all of the cops. They loved it. In fact, my favorite photo I took was all of the deputies with Trump (I’ll post it tomorrow). I was struck by how Trump didn’t forget the “little people.” Even though it was just a few of us and no media, he was relaxed and took the time to get photos with everyone. The rally itself was super cool. Lots of energy, packed room (something like 2000 people had to be turned away because the auditorium was packed – and just on 24 hours notice! ), everyone stood the entire time even though they all had seats. One thing I want to mention is the baby crying, because that has been national news. Contrary to news stories, it was a very funny thing, Trump was very supportive of the mom calling her and her baby “beautiful” and “wonderful”, and then when the baby kept crying he turned it into a joke. Everyone was laughing and it was actually very endearing and funny. Not at all anti mom or anti baby like the media has portrayed it to be. Which brings me to the final point: I was there and saw and heard the entire event with the mom and baby. There was nothing to it. But then after I’m reading all the news coverage saying “Trump hates moms and babies!! !” I started to doubt myself. Did I really miss a huge story right in front of me? I started asking others who were there, including a husband and wife with young kids. And everyone in the room said the same thing: there was no story here. Trump was being funny and personable and going out of his way to make sure the mom wasn’t embarrased by making it a funny situation. The media has lost touch with integrity as they attempt to control the election. It’s time to ignore them. Channel 5 in Northern Virginia reported last Tuesday that five arrests related to ISIS have been made in Northern Virginia in recent months. The article also mentions Reza Niknejad of Prince William County. He was dropped off at Dulles International Airport last year with plans to join ISIS. No one has seen him since. I think it is time to start paying attention to what is being taught in the mosques of America. Terrorists in America are not materializing out of thin air. I realize that they have the internet, but I am inclined to think that they also have inspiration closer to home. Most of the large mosques in America are built and funded by the Islamic Society of North America. This organization is named as a friend of the Muslim Brotherhood in the Exhibits in the Holy Land Foundation Trial. The exhibit which names the group is the Muslim Brotherhood document entitled, “An Explanatory Memorandum on the General Strategic Goal for the Group in North America.” If you have never read this document, please google the exhibits and read it. It is chilling. Political correctness has become acceptable in recent years. Television shows that we watched as children or young adults would not be allowed on the air today. I loved the show “WKRP,” but I doubt that show would be allowed on the air today because of the stereotypes of women, blacks, disc jockeys, newscasters, etc. However, it was a very entertaining show because of the way the characters were drawn. It was not meant to offend any one group of people–it simply laughed at who we all are. So what happens when a person who is mentally ill decides to take political correctness to its limit? The New York Post posted a story today about the recent killing of a newswoman and a news cameraman in Virginia. The story is a clear illustration of political correctness run amok. The story also illustrates what happens when a disturbed person decides to be offended by something that is not meant to be offensive or that most of us would not consider offensive. The article goes on to explain that Flanagan interpreted out in the ‘field’ as a reference to cotton fields. In his twisted mind, that was a racist statement. How do you deal with a person who is constantly offended by the world around him? Do you refer him for mental testing? Do you put him on some sort of watch list? It seems to me that Flanagan was going to explode at some time. It is a shame that explosion could not have been prevented (without infringing on his civil rights).